These embroideries consist of one complete and two incomplete apparels. Apparels are rectangular decorative panels that were placed at the hems, necks and on the sleeves of two types of ecclesiastical vestment: the alb, an ankle-length linen tunic worn by priests and others, usually beneath other vestments; and the dalmatic, a sleeved vestment worn by deacons when assisting at the Mass. It is thought that these apparels may be from an alb. They show scenes from the life of the Virgin and her parents, set under Gothic arches. The scenes include the annunciation to St Anne (the Virgin’s mother), the birth of the Virgin, the annunciation to the Virgin, the nativity of Christ and the journey of the Magi (wise men). A number of scenes that usually form part of the life cycle of the Virgin and her parents are missing and from this we can deduce that there must originally have been a fourth apparel. 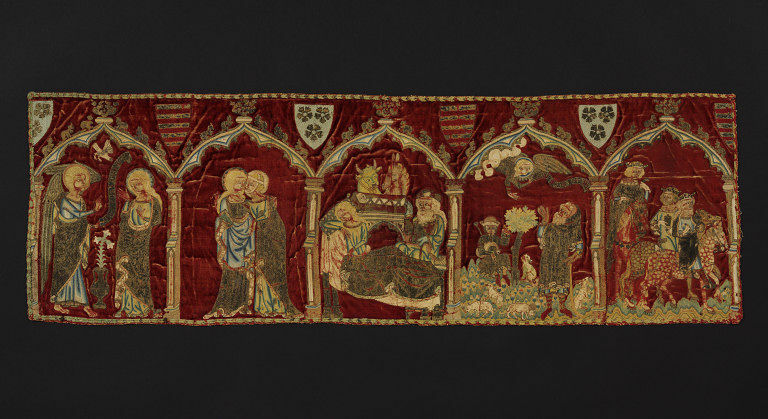 The embroideries demonstrate beautifully the lively narrative style that was a notable feature of ‘opus anglicanum’ (Latin for ‘English work’) in the late 13th and 14th centuries. Velvet grounds were first used in opus anglicanum in the late 13th century and act as a perfect foil for the rich silk and gold embroidery. An early reference to the use of velvet occurs in the inventory of St Paul’s Cathedral, London, from the year 1295. Only some of the shields of arms can be identified and they do not give any clear evidence of the identity of the original owner or donor of these apparels. However, the very fine quality of the work and design indicates that the family or church from which they originated must have had considerable wealth and standing. The embroidery is worked in underside couching, split stitch, laid and couched work, with a little raised work. Panels showing scenes from the life of the Virgin and her parents, set under Gothic arches. Between the spandrels of the canopies are two armorial shields repeated alternately. Crimson velvet embroidered with coloured silks in split stitch and laid and couched work, silver and silver-gilt thread with underside couching. Small details in raised work. In the first panel, presumably after two missing scenes, appear the Annunciation to St. Anne, the Meeting at the Golden Gate, and the Birth of the Virgin. In the second apparel, the Presentation of the Virgin in the Temple, and the Education of the Virgin would have been followed by three further scenes, now missing. The third apparel, which is complete, shows the Annunciation, the Visitation, the Nativity, the Annunciation to the Shepherds and the Journey of the Kings. When the panels were acquired, it was suggested that the two armorial shields were to be the biazon of Thornell de Suffolk and one that of the family of Fitton. The treatment of the frame is very like that of two panels from a burse (T.1 and 2-1940), and the embroidery is exquisitely fine, creating expressive faces and lovely details. High quality. The construction of the embroidery on velvet would have involved three layers of fabric; linen backing with the velvet above, with an additional layer of fine linen on top on which the design would appear. The embroidery would be worked through all three layers and, on completion, the top layer of linen was cut away to reveal the velvet. The apparels are a fantastic source for 13th and 14th century fashion and bed linens, but also rare depictions of dress by lower class, represented by the Shepherds, showing sturdier garments, practical and warm mittens, boots and hood with liripipe. Note also the bagpipe which resembles a cat, commonly used by lower class for fur lining and fur borders. Most interestingly, the women, St Anne and Mary are dressed in the fashions of early 14th century, displaying expensive mantles fully lined with miniver (easily recognised by the white blocks with edging of grey, which was made up from the bellies of Baltic squirrels taken in winter) which was particularly fashionable in the 13th and 14th centuries. The bed covers are also lined with miniver. The young Mary is wearing the new popular overdress, the sleeveless surcoat over a tight underdress, kirtle. The sleeveless overdress came into fashion 1310s- early 1320s, and representing a younger fashion, while St Anna show a slightly 'older' dressing, with a quite untailored and full dress, maybe suitable for a mature woman. In the scene The Education of the Virgin, St Anna is holding down the mantle cord to prevent the mantle slipping back and choking its wearer, which is fashion of the previous century, as is bunching up the cloak in folds and holding it against the body with the forearm. This type of deportment was last seen in the 1310s by fashionable ladies. The headwear of St Anna and Elisabeth, consisting of a barbette (linen band passing under the chin to the temples and fastened on top of the head), worn with a linen band encircling the head and hairnet, further emphasises they are married women while Mary is depicted with her long hair loose, only acceptable for young girls, brides and queens at the coronation to wear their hair uncovered in the Middle Ages. Joseph is portrayed as a grandfather with practical loose tunic and long beard, which usually denoted old age, foreigner or, which is more suitable in this case, wisdom. One of the kings on the other hand, as expected is shown as a medieval dandy, with soft curls and small fringe and fine, presumably, kid gloves. Note also the swaddling of baby Mary - and the swaddled baby Jesus. The display of beds and bedcoverings in the scenes, and other furniture, otherwise rare sightings, are particularly rich and informative for early 14th century, for example miniver lined bed covers, and interesting depiction of long pillow with star shaped textiles. Historical significance: Medieval church art was greatly concerned with the pictorial representation of biblical stories; this was a way of teaching an illiterate population. These scenes would have been like a cartoon for the church’s congregation, where the scenes would clearly visualise the important events leading to the birth of Christ. A number of alb-apparels of generally similar type were recorded at Westminster Abbey in 1388, e.g. a red apparel containing Annunciation, Visitation, Nativity, Adoration of the Kings and Presentation of Christ in the Temple. 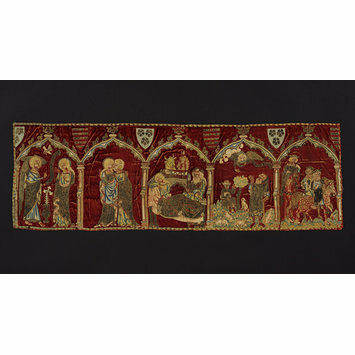 Opus Anglicanum: English medieval embroidery: The Victoria and Albert Museum, 26 September to 24 November 1963 (London: Arts Council, 1963), cat. 73, plate 14.